Submitted by Alexander Briones on Dec. 11, 2017..
94 out of 100. Incorporating 550+ ratings and reviews. NB: This has been superseded by the QSC K12.2. The K12 was the biggest and the loudest of the three sub $1000 K Series speakers from QSC, with a max SPL of 131 dB. It features a 12" LF driver that is housed in a bigger cabinet, which makes it heavy yet reasonably portable. The amplifier section, built-in DSP and dispersion are similar, so you are getting the same sound quality and projection, but with more power and low end. Another nifty feature of the QSC K12 is its dual angle pole socket, which lets you angle the speaker downwards by 7.5 degrees. The same HF and LF EQ switches are available, for fine tuning the sound to your preference, its most prominent feature being Voice Boost, which is ideal for speeches and for emphasizing vocals. The QSC K12 gets positive reviews for its loud yet clear sound, from users with varying musical tastes and backgrounds. Connectivity options and reliability are also praised by musicians who have been regularly gigging with this speaker, citing the speaker's tough ABS exterior and solid build as noteworthy features. There are but a few minor complaints on the K12, one of which being the XLR cable sometimes falling out when in floor monitor position. If you want QSC's sound quality with more bass - without having to add a bulky and heavy subwoofer into your setup - then the QSC K12 is highly recommended. by Jason Horton on Jan. 7, 2016. I have processed thousands of review sources for Gearank and rarely have I seen a product that is so consistently raved about by its owners as I have just now while researching the QSC K12 12" Powered PA Speaker. It's popular with bands, DJs and audio engineers for use both as an FOH speaker and a foldback wedge or stage monitor - many people even report using it satisfactorily as a studio monitor. It's important to note that these are more expensive than many other options available (you can get some for close to half the price), which makes the high ratings it has received even more impressive than they would ordinarily be. It provides a total of 1000 watts via the Class D amplifiers and can peak at 2000 watts. It has built in DSP (Digital Signal Processing) which performs a range of functions to keep the sound crisp and clear across a wide range of frequencies and volumes - one proprietary function is DEEP (Digital Extension and Excursion Processing) which allows it to produce low frequencies at volumes not usually associated with a speaker enclosure as small as this - some people even report they get a similar response to using a sub woofer. I'll get into the negatives first because there weren't many. I looked hard to find negative reviews of the QSC K12, there are some but there are few who consistently report the same issue - the only one that seemed to come up multiple times from people who knew what they were doing, was that the XLR cables sometimes fall out when using it in the foldback wedge position. There were a few DJs who reported that they were hitting the power limit, but this seemed to be because they weren't using the correct inputs for the power level their mixer was putting out. Just about everything about them from the loud volume to the crisp and clear sound it outputs to the range of connectivity options provided. Reviewers who had been using these for over a year also praised their solid construction and durability afforded by the ABS Thermoplastic enclosure, steel grille and aluminum handles - something which is vital for those who a gigging regularly - the manufacturer backs this up with a 3 year warranty. A thoughtful feature that a few reviewers quite liked was that the power cable clips into place and can't be removed without depressing a release button - you don't have to worry about the power cable falling out when you're driving the speakers hard. Submitted by j rayner (not verified) on Jul. 1, 2016. 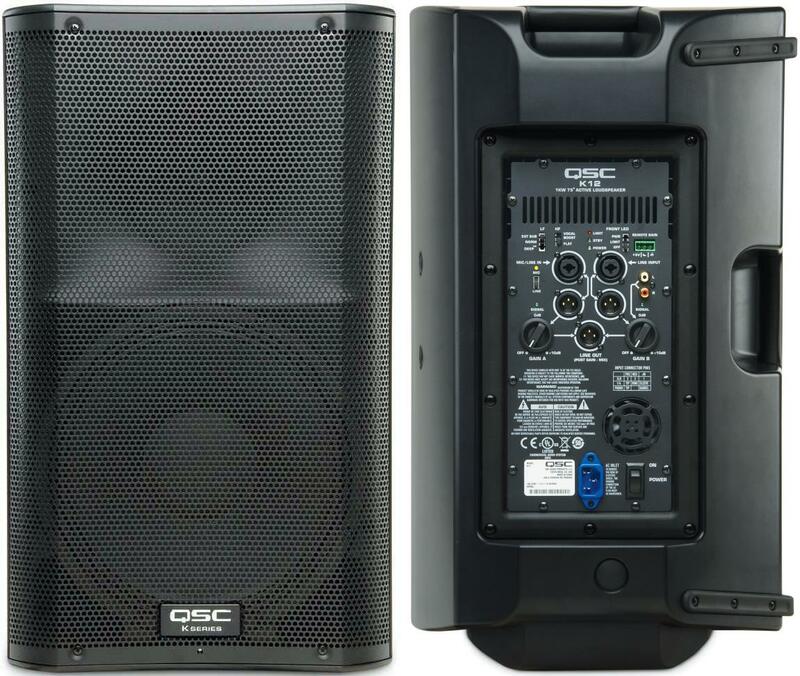 We have 2 x QSC 12 speakers for foh,,,,can these speakers be doubled up to run 2 x QSC speakers per side or even 3 per side without causing problems with sound cancellation?